Yet General Manekshaw himself recounted a cabinet meeting in Mrs Gandhi’s office in April 1971. To forestall secession, the Pakistani government had already cracked down in what was then East Pakistan. Hundreds of thousands of refugees had crossed the border into India. Mrs Gandhi wanted the army to invade Pakistan. General Manekshaw resisted. The monsoon, he pointed out, would soon start in East Pakistan, turning rivers into oceans. His armoured division and two infantry divisions were deployed elsewhere. To shift them would need the entire railway network, so the grain harvest could not be transported and would rot, bringing famine. And of his armoured division’s 189 tanks, only 11 were fit to fight. He was not, in other words, ready. But, as he put it, “There is a very thin line between being dismissed and becoming a field-marshal.” Mrs Gandhi rejected the resignation he offered, and acceded to the delay he wanted. His job, he told her, was to fight to win. In December he did, cutting through the Pakistani army like a knife through butter, and taking Dhaka within two weeks. Quibblers later noted that this was not one of his original war aims. He had the most important attribute of any successful general: good luck. That was not the only time he threatened to quit. Mrs Gandhi once questioned him about rumours that he was plotting a coup. In response, he asked if she wanted his resignation on grounds of mental instability. Yet if she and other politicians were in awe of him as a professional soldier and grateful for his lack of political ambition, his men loved him for his willingness to take on their civilian bosses and stand up for the army’s interests. There was something of British military tradition in his stiff upper lip, the lavish handlebar moustache in which he cloaked it, the dapper little embellishments to his uniform and his partiality for Scotch whisky. Yet he was born into a very particular and tight-knit community: India’ s small and dwindling Parsi minority, which has produced a disproportionate number of leading Indians, such as the members of the Tata and Godrej business dynasties. 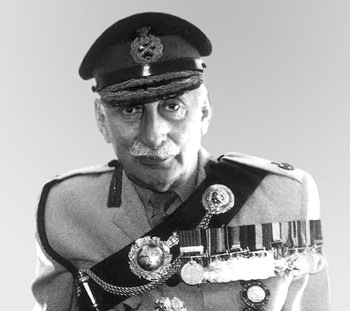 Sam Manekshaw was another Parsi overachiever. He was the first of only two field-marshals ever created in the army. Yet his retirement since 1973 was not one long bask in glory. Former deputies felt he had monopolised the credit for various victories. Then last year his name was linked to bizarre allegations, by the son of a former Pakistani president, against an unnamed brigadier who had once sold Indian war plans to Pakistan. All nonsense, said those who knew him. Already in hospital, General Manekshaw was in part shielded from controversy. After his death, anger at the slur, and at the lack of proper honour for one of India’s true heroes, rumbled on. The prime minister, along with the army, navy, and air-force chiefs, all missed his funeral—which was a modest one held in Tamil Nadu in the south, not a grand one in the capital. His friends grumbled that even foreigners such as Lord Mountbatten were afforded greater respect in death. Bangladesh, however, paid grateful tribute to his part in the nation’s foundation. He too might well have been disappointed that his obsequies were not grander. His last words were “I’m OK”, though he had rehearsed a better line nearly 37 years earlier. For death at least, the brave soldier had indeed shown himself “always ready”.